It is that time again where we report our dividend income results. We are almost half way through 2016 and the dividend income just keeps coming in! I just love reporting these numbers out each month. They provide a nice recap of where we currently are in building this awesome sustainable income stream. These reports also gives us time to look back at where we were just 4 short years ago. I know they help keep us motivated building this income stream and hopefully they motivate you too! 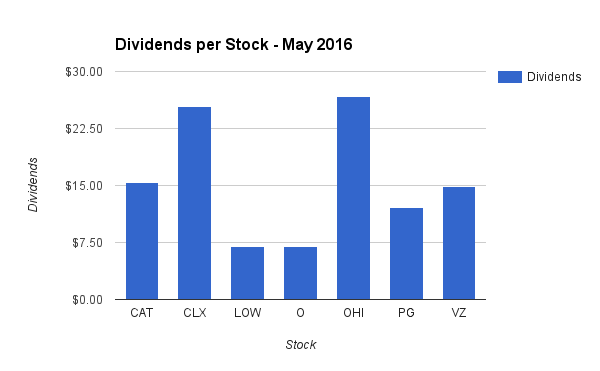 This past month was the most successful May for dividend income that we have ever reported. For the first time ever, we broke the $100 dividend income barrier for May. We are on pace to earn at least triple digits ($100+) for every single month this calendar year (2016). We saw an increase of over 123% last month compared to May 2015! A lot of this increase can be attributed to new money being invested in the market over the last year. We hope to see similar gains as we continue to report our dividend income throughout the year. We still had $1,000+ to reinvest back into the market from our April sale of COP and BHP. We decided that it was time to sell both of those stocks based on our rule for when to sell a dividend stock. After the sale, we took a portion of the funds and purchased 15 shares of ADM and 3 of AFL back in April. Since we did not want to let this money sit idle any longer, we used the remaining balance to invest in more shares of dividend stocks during May. These funds gave us an opportunity to build the number of shares of two stocks that we previously owned. We took advantage of our latest tax refund and invested $1,641.26 into the market by making lump sum investments in – EMR, GPC, and JNJ. We still have more tax refund dollars to invest later in the year. In addition to our lump sum investments, we made some changes to our monthly automated investments. As discussed in a previous post, we are trying to invest 20% of our income. One step that we are taking to help reach this goal is to increase our automated monthly investments. As a result, we contributed $800 in automated monthly investments. We kept our normal automatic investment in Microsoft and Verizon. Our WalMart monthly investment was bumped up by $100 and we initiated a new monthly $350 investment in Target. The Microsfot, WalMart, and Target investments were made through LOYAL3 and the Verizon through Computershare. We decided to eliminate our monthly investments in – Unilever, Dr Pepper Snapple, Kellogg, Coca-Cola, and Kraft Heinz through LOYAL3. In addition, this will be the last month for our Verizon investment. The plan is to continue increasing our new investments through our income savings and with additional tax refund dollars. 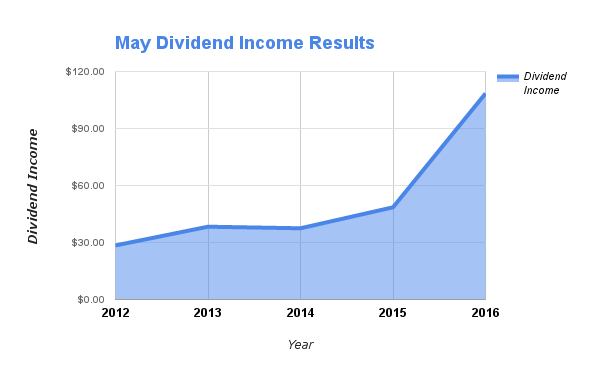 The dividend income earned in May ($108.43) was up over 123% from the same time last year. This is all a direct result of staying focused on investing new money into the stock market. This was the first time ever that we earned over $100 in dividend income for the month of May. Comparing to where we were last May (less than $50), it provides great motivation that our sustainable income stream is growing. Our goal for 2016 is to earn $2,250 in dividend income. To date, we have earned $665.22 in dividends for the year. At this point, we are on pace to earn a little over $1,730 in dividends for the year. That is certainly above last years totals ($1,475) – but well below our goal for this year. We got some work to do! 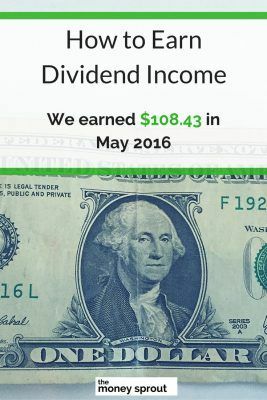 How was your dividend income in May? Full Disclosure – At the time of this writing, we owned shares in the following stocks noted in this post – ADM, CAT, CLX, DPS, EMR, GPC, JNJ, K, KHC, KO, LOW, MSFT, O, OHI, PG, TGT, UL, VZ, and WMT. The material above is not a recommendation to buy. Please do your own research on a company before deciding to invest.